First let me take a moment to express my deepest, most sincere thanks to everyone for sending me their heartfelt comments and emails. They have meant a great deal to me and I cannot thank you all enough for taking the time to send them. I honestly had no idea that my little blog could mean so much to so many people. So here’s to leaving the past behind me and focusing on what’s to come. So far life has been pretty good! Over the next several posts I'll share with you what I was been busy making over the last, er, year or so, but today, I want to tell you about a very special cake I made a few weeks ago for some unbelievably sweet and thoughtful little kids who just adore their mom and dad. I was at my friend’s house one day when some kids from the neighborhood were outside playing. 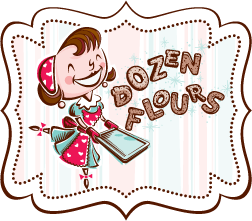 They know that I love to bake and had the opportunity to sample a few of my confections. One of the little girls, Sam and her little brother Tyler, ran up to talk to me. A little out of breath from playing (I love seeing little kids playing – so rare these days! ), Sam sat down on a stool and looked very serious. “Julia? We were wondering. Would you make us a cupcake?” Her little brother Tyler was silent, stared at me intensely, and had a huge smile from ear to ear. “Only one cupcake? Why?” I replied. I couldn’t help but notice how serious Sam was taking this conversation. She was all business. “The reason I’m asking is because, well....it’s our parents anniversary in a few weeks and we want to give them a cupcake. And since we’re not allowed to use the stove we can’t bake them anything so we thought maybe you could do it. We’re gonna get up early, at like SIX o’clock when my mom and dad are still asleep. We’re gonna make them breakfast in bed. Yeah...cereal for my mom and toast for my dad. I’m allowed to use the toaster.” Tyler never took his eyes off of me, still smiling from ear to ear. “Definitely!” Sam was practically glowing with delight. Tyler was shaking his head in agreement an exaggerated fashion, still smiling widely. After much discussion and collaboration, we decided on a flavor both parents would enjoy. “My mom and dad love chocolate covered cherries! Oh boy do they!” Sam and Tyler giggled with delight, obviously recalling some memory where their parents were enjoying the confection. I drew a little cake design so they could picture what it would look like and got their approval. I wrote down all the details, especially noting the fact that the cake had to have a cherry on top as this was Tyler's only request. It was official. The plan was to deliver the cake the night before, leave it at my friend’s house and then Sam would come and get it very early the next morning to retrieve it. Part of their order was for me to write “We love you mom and dad” on the top but I decided to let the kids do this by writing on a little banner I made out of gum paste. The night I delivered it, they came over, Sam having just gotten out of the tub. They loved the cake and the banner idea. I handed each of them a food-coloring based marker and let them write what they wanted. This is what they wrote: Everything went according to plan. 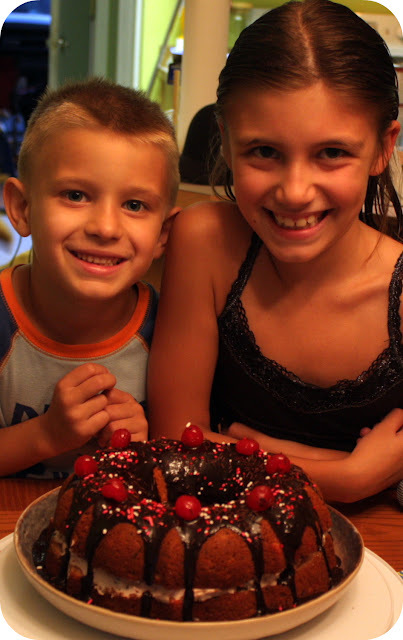 The kids were ecstatic and Mom and Dad loved the cake. Overall it was a smashing success. Everyone was happy, especially me. What amazingly thoughtful kids! This will be a precious little baking memory I won’t soon forget. I strongly recommend making this cake the day before you need it. The flavors really develop the longer it can sit. Note that you don't need to make the filling - you can skip this step entirely if you want. 1. Make the filling. Cover. 2. Make the cake. Let the cake cool completely. Cover. 3. Let them both sit in the fridge over night. 4. Slice the cake in half, horizontally. 5. Spread the filling on the bottom layer of the cake and top with the top layer of cake. 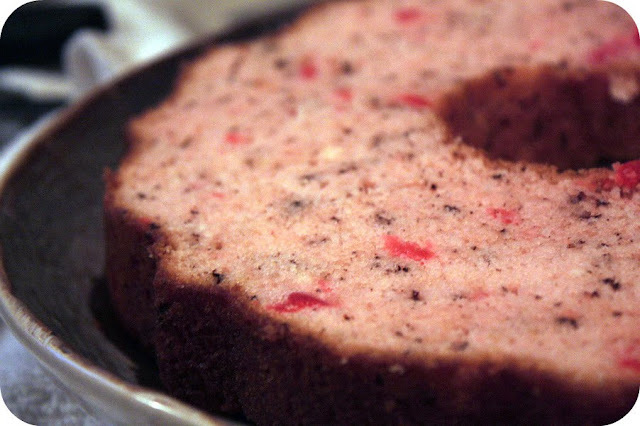 Put the cake in the fridge to firm up (about 1/2 hour or several hours). 6. 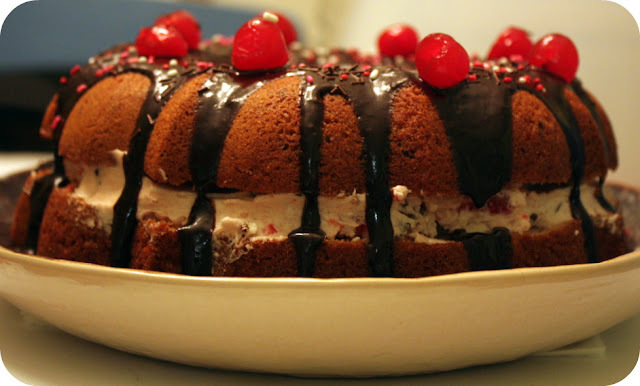 If you want cherries as garnish on your cake, drain 8 maraschino cherries on paper towels. Try to remove as much moisture that you can. Set aside. Get any sprinkles you want to use ready -- a few teaspoonfuls is all you'll need. 7. Remove your cake from the fridge. Set aside. 8. Make the glaze and pour it over the cake. 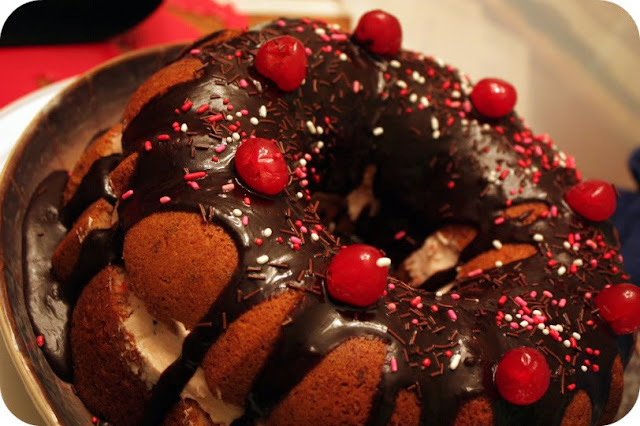 Quickly decorate with sprinkles and maraschino cherries, if desired. 9. Let the cake sit for at least a half hour or until you're ready to eat it. Place the cake mix, melted ice cream, and eggs in a large mixing bowl. Blend with an electric mixer on low speed for 1 minute. Stop the machine and scrape down the sides of the bowl with the rubber spatula. Increase the mixer speed to medium and beat 2 minutes more, scraping the sides down again if needed. The batter should look thick and well blended. Pour the batter into the prepared pan, smoothing the top with the rubber spatula. Place the pan in the oven. Bake the cake until it springs back when lightly pressed with your finger and just starts to pull away from the sides of the pan, 38 to 42 minutes. Remove the pan from the oven and place it on a wire rack to cool for 20 minutes. Run a long, sharp knife around the edge of the cake and invert it onto a small rack, then invert it again onto a second rack so that the cake is right side up to complete cooling, 30 minutes more. Using the whisk attachment on your electric mixer, mix the powdered sugar, salt, vanilla and milk at low speed until smooth. Add butter, one slice at a time, until incorporated add shortening and whip at highest speed 10-12 minutes, until volume increases by at least 50%. Add 1/4 cup of the melted ice cream, all the chocolate covered cherries, and the maraschino cherries. Mix on medium speed until well blended. Add the remaining 1/4 cup of ice cream and the juice. Blend again and set aside. Don't make this until you've assembled your cake. Have your sprinkles and whole maraschinos ready because your glaze is going to set up quickly and you'll want to get your sprinkles and cherries on the cake before it sets. In a small saucepan add the sugar, butter, and milk together and cook over medium-low heat, stirring constantly. Continue to mix until the mixture comes to a boil. Boil, stirring constantly, for 1 minute. Remove from the heat and stir in the chocolate chips. Let it sit for 2 minutes or until the chocolate chips are melted. Whisk everything together until it's well blended and smooth. Slowly pour the glaze over the cake, going around the top of the cake so that the glaze can run down the sides. You may not use all your glaze, but it's really your choice how much you want to use. Would I Make This Again? I love making cakes using melted ice cream cakes. 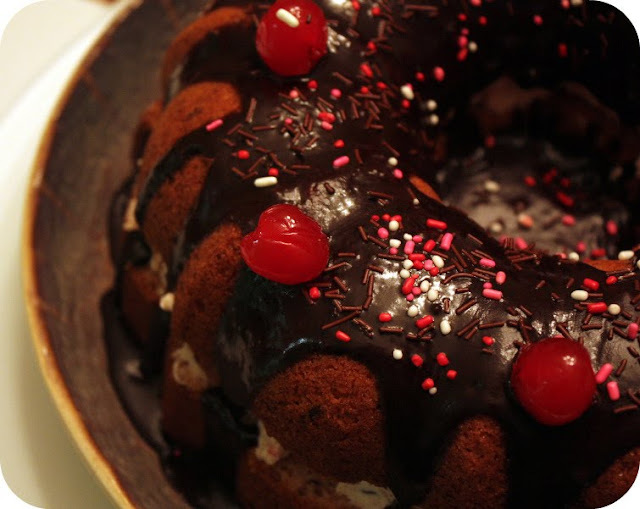 You have the option of keeping it super simple and just having the cake, splitting the cake and filling it, topping it with glaze, or go all out like I did and do all three. It never fails to impress! What a wonderfully kind thing to do. The cake, by the way, looks absolutely amazing and so delicious. I love chocolate cherry combos too. What a great story!! LOVE the kids! The cake looks fantastic, can't wait to give it a try! Looking forward to reading more! What sweetie pies!! (The kids and you!) The bit about it being round - such a kid thing to say! I had no idea you could make cakes with ice cream...a whole new world has just opened up for me! I love the story to go with the cake! Awesome! Julia ~ Thank you so-o-o much for such a sweet, heartwarming story. You write as beautifully as you create! I am so glad to see your decision to return to your blog. You are loved by many . . . please continue your journey! What a sweet sweet story! I love how well it's written and you did a fan-tabulous job on the cake!! I bet the kids were just beaming when they gave that cake to their parents! Great job on yet another great post...I don't mind waiting! 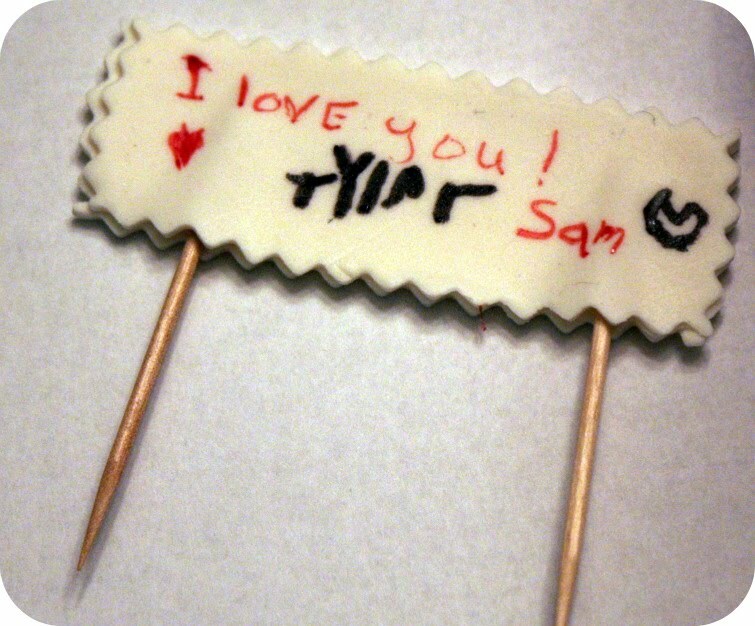 u cant help but go "aaaaaaaw' at sam and tyler. How very thoughtful and sweet! The cake looks very cute and suitable for the event. i love it! Welcome back!! This is such a sweet post :D Beautiful cake! This looks amazing and what a cute story to go with it! SO glad to hear that things are on the up swing. Hope Jake is doing well, too. That is the sweetest story ever! What thoughtful loving children and you are the best! The world needs more kids and people like you all!! I love the Jubilee cake, it looks so wonderful! Thank you for making my day with that wonderful story! Hello Julie!! Hope all is well. I was making some cannoli with Mom and thought about your blog!! Be good! I want this now please! I love cherries! I’ve started to look for blog help more regularly and I think I’m going to add your blog to my list as well. Thanks for the post! I love, love, love that story! Thanks for sharing. That is one beautiful cake! Lovely! Amazing goodies on ur blog, am so happy to find ya. This cake sure is not only creative and pretty but sure delicious too.